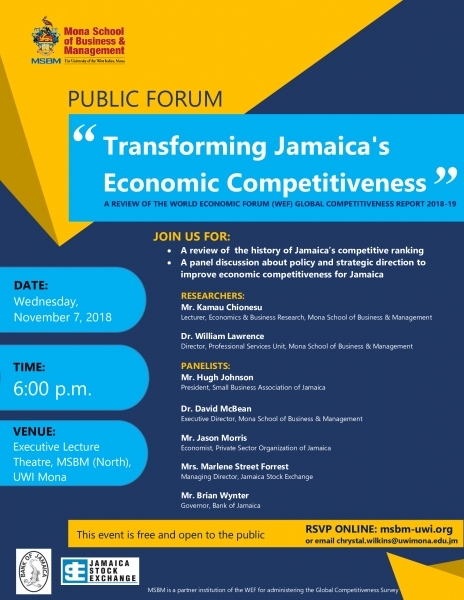 Mona School of Business and Management (MSBM), in partnership with the Bank of Jamaica (BOJ), the Private Sector Organization of Jamaica (PSOJ) and Jamaica Stock Exchange, will host a public forum on Wednesday, November 7, 2018 to review Jamaica’s recent economic performance and discuss the implications of the 2018-2019 Global Competitiveness Report from the World Economic Forum (WEF). The Forum will begin at 6:00pm and will be held at the Executive Lecture Theatre, Mona School of Business and Management (North). Under the theme, “Transforming Jamaica's Economic Competitiveness" the event will focus on the history and status of Jamaica's competitiveness as reported by the World Economic Forum and the implications for Jamaica's policy and strategic direction. The forum forms part of MSBM’s continuing role to advance scholarship by combining academia and industry to create research based solutions. Since 2001, WEF has selected MSBM as its partner institution for administering the Global Competitiveness Survey for Jamaica. The main feature will be a review of the WEF 2018-2019 report by researchers Dr. William Lawrence, Director, Professional Services Unit, MSBM and Mr. Kamau Chionesu, Lecturer, Economics and Business Research, MSBM. This will be followed by a high-profile panel discussion featuring Brian Wynter, Governor, Bank of Jamaica, Marlene Street Forrest, Managing Director of the Jamaica Stock Exchange, Hugh Johnson, President of The Small Business Association of Jamaica and Jason Morris, PSOJ Executive member. This year, Jamaica ranked 79 out of the 140 countries which participated in the Global Competitiveness Survey, falling nine places behind its 2017-2018 ranking of 70th position, which saw the country being named the highest rated in the Caribbean. Dr. William Lawrence shared that while the country has fallen behind, Jamaica has the potential to improve its global competiveness, through a number of measures including an increase in innovation. “Mona School of Business and Management is pleased to collaborate with these industry partners to stage this significant event to guide the development of policies and strategies to enhance Jamaica’s competitiveness. This forum provides an excellent opportunity for the public and other key stakeholders to learn and participate in robust discussions surrounding the transformation of Jamaica’s economic competiveness,” Dr. Lawrence stated. Members of the panel are expected to make suggestions on how to improve Jamaica’s competiveness in the global space, the combination of national policies and business strategies needed to increase economic growth and improve the livelihoods of Jamaican citizens, as well as ways in which universities and other supporting institutions can transform the competitiveness of the Jamaican economy.